As each week passes the number of indictments and sentencing hearings seem to increase as the mortgage financial system seems to unravel. Some have claimed that the mess today will become larger and more costly than the Savings and Loan crisis of the ’80’s. Here’s a snapshot of the week. The investment would be secured by a legitimate deed of trust. Instead, according to the indictment, Ms. Camus used the money she obtained from investors for personal expenses and to pay back prior investors. Camus, if convicted, faces 20+ years in prison. South Florida: Sentencing for Mortgage Fraud: Richard Weldon Crowder, II and Gary Mark Mills were sentenced to 108 months and 46 months imprisonment respectively for their roles in a multi-million dollar mortgage scheme. Co-defendant Karen Lynn Sullivan was sentenced yesterday to 50 months’ imprisonment. Crowder is a former licensed mortgage broker and the former owner of America’s Best Mortgage Services, Inc., located in Coconut Creek, Florida. Mills is a former title attorney and the owner of Four Star Title Inc., located in Deerfield Beach, Florida. Sullivan is a former loan officer for Wachovia Bank. To effectuate the mortgage scheme, Crowder identified residential properties, including luxury condominiums on South Beach, that were available for purchase. He then recruited buyers for the properties, representing that he could obtain 100% financing for their purchase. After finding a purchaser, Crowder would apply for equity lines of credit on their behalf with Wachovia. To induce Wachovia to issue the equity lines of credit, Crowder and Mills prepared fraudulent HUD-1 settlement forms. The forms falsely stated the buyers already owned the properties and also significantly understated the amount of the first mortgages on the properties. The fraudulent HUD-1 settlement forms were then given to Sullivan, who used the forms to facilitate the issuance of equity lines of credit from Wachovia. Simultaneously, or shortly after obtaining the equity lines of credit from Wachovia, Crowder applied for the first mortgages on the properties. These applications overstated the buyers’ assets and income, and also included false verification of deposit forms prepared by Sullivan. To further induce the lenders to issue the loans, Mills prepared documents falsely representing that the buyers were using their own money for the down payments and closing costs. In fact, the buyers were using funds from the fraudulently obtained Wachovia equity lines credit or funds provided by Crowder. In total, the defendants caused the fraudulent purchase of seventeen (17) different luxury condominiums at The Continuum on South Beach and at The Point in Adventura using more than $37,000,000 in fraudulently obtained mortgage loans. 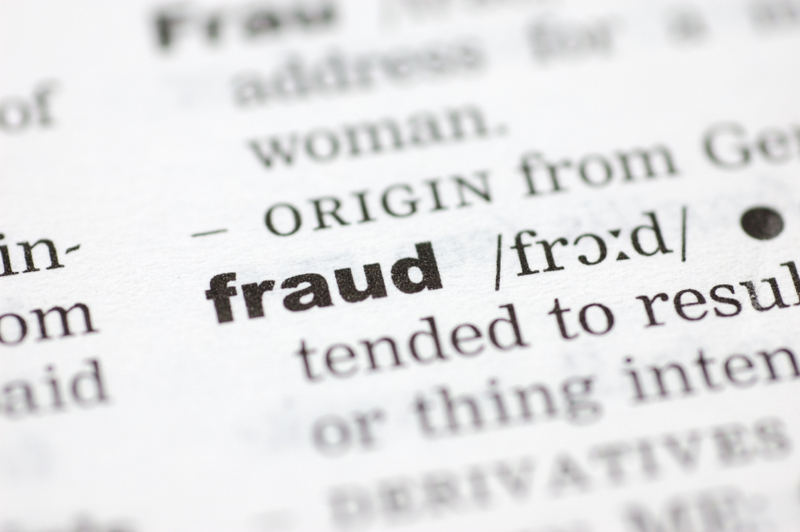 Palm Beach Co, Florida: Indictments in Sophisticated Mortgage Fraud Scheme: Berry Louidort, Lauren Jasky, and Ralph Michel, Palm Beach County, Florida were charged in a Criminal Complaint filed in federal court on April 22, 2008. The defendants are charged with bank fraud. According to the Complaint, defendants Louidort, Michel and Jasky were involved in a sophisticated sub-prime mortgage fraud scheme in South Florida through which they submitted false qualifying information regarding potential borrowers to mortgage lenders. Among the false information the defendants submitted were false verification of earnings and false verification of deposits. As a result of these false submissions, defendants Louidort and Michel received approximately $6 million in loan proceeds. This investigation began with an audit conducted by the Florida Office of Financial Regulation into 24 sub-prime mortgage loans in the period November 2006 to June 2007. The initial audit showed that the loans included what appeared to be excessively large fees paid to defendants Berry Louidort and Ralph Michel. The fees, ranging from $29,000 to $650,000, were described as marketing and/or assignment fees. In reality, the fees were kickbacks to defendants Louidort and Michel based on inflated sales prices. The audit also revealed that the majority of the suspect loans were originated by defendant Lauren Jasky, Senior Vice President of Compass Mortgage Services, located in Boca Raton, Florida. Atlanta, GA: 5 Sentenced to Prison for Mortgage Fraud: Virginia Rose Novrit, Hilton Head, SC; Clarence Lorenzo Davis, Hilton Head, SC; Olympia D. Ammons, St. Louis, MO; Jerome Wings, Jr., Atlanta, GA; and Ronald Denzil Martin, Lithonia, GA were sentenced to prison for conspiracy, bank fraud, wire fraud, and money laundering in a multi-million dollar mortgage fraud scheme. NOVRIT was sentenced to 3 years, 5 months in prison and ordered to pay $839,585 in restitution. DAVIS was sentenced to 4 years, 3 months in prison and ordered to pay $839,585 in restitution. WINGS was sentenced to 10 years, 2 months in prison and ordered to pay $8,577,845 in restitution. AMMONS was sentenced to 5 years, 3 months in prison and ordered to pay $7,549,044 in restitution. MARTIN was sentenced to 1 year, 1 day in prison and ordered to pay $423,595 in restitution. From late 2004 through early 2006, NOVRIT, DAVIS, WINGS, AMMONS, and MARTIN participated in a mortgage fraud scheme that involved millions of dollars in fraudulently inflated mortgage loans being provided to unqualified straw borrowers. The straw borrowers were paid as much as $600,000 per property from fraudulently obtained loan proceeds through shell companies. NOVRIT and DAVIS together obtained mortgage loans totaling more than $4 million within a six month period to purchase eight properties. WINGS obtained mortgage loans totaling over $1.2 million to purchase a single property by providing the lender with false qualifying information. WINGS also recruited a number of other unqualified buyers into the scheme and obtained a share of the fraudulently obtained loan proceeds from those transactions for doing so. AMMONS was a loan originator for “Ace Mortgage Funding,” a national mortgage brokerage firm. AMMONS brokered fraudulent mortgages totalling over $7 million. MARTIN was paid $75,000 to act as a straw buyer and submit a fraudulent loan application for one property. Kansas City, Kansas: Bonds Revoked in Mortgage Fraud Case: Wildor Washington, Jr. and Victoria Bennett were charged in November 2007 in an indictment alleging that Washington, Bennett and four co-defendants took part in a mortgage fraud scheme through businesses Washington owned including Heritage Financial Investments, Legacy Enterprises, B&L Custom Development and Liberty Escrow. According to the indictment, Hamilton and the conspirators prepared fraudulent loan applications and submitted them to lenders in Kansas, Texas, Ohio, Missouri and Michigan. On Nov. 8, 2007, Washington and Bennett were released on bond subject to conditions including a prohibition against taking part in any illegal activities while on release. Subsequently, investigators obtained evidence that while on release Washington and Bennett were involved in further incidents of bank fraud and conspiracy to commit mail and wire fraud. Hence the two were taken into custody after their bonds were revoked. Minnesota: Real Estate Owners Plead Guilty to Mortgage Fraud: Jonathan Edward Helgason, 45, Chisago City, and Thomas Joseph Balko, 37, Rogers, along with their company, TJ Waconia LLC, entered their guilty pleas to a scheme involving at least 162 properties, principally in north Minneapolis, and mortgage proceeds of approximately $35 million. From approximately 2005 to 2007, Helgason and Balko executed a scheme to defraud and to obtain money by means of false and fraudulent pretenses. Using the TJ Group, Helgason and Balko purchased approximately 162 properties throughout the Twin Cities metropolitan area, principally in north Minneapolis. They would then resell the property within a few weeks to an “investor” who would purchase the property, sight unseen, at a price set by Helgason and Balko without negotiation, oftentimes $20,000 to $60,000 more than that the TJ Group had paid. People were told by Helgason and Balko that the investors were simply “lending” his or her credit to TJ Waconia. In exchange for “lending” their credit, the investor would receive a kickback payment of about $2,500 and a promise of an additional payment after two years when the TJ Group was to repurchase the property from the investor. Through the scheme, the defendants perpetrated a fraud on the lenders who were led to believe that the “investors” were the actual owners of the properties, when, in fact, the “investors’” ownership was in name only. During the two-year period during which the investor owned the property, the TJ Group was responsible for all payments and maintenance on the property. In some instances, Helgason and Balko also provided investors with funds to pay the buyer’s portion of the property purchase price and worked with others to provide lenders with false loan applications on behalf of the investors so that they would qualify for the loan. The two men, on behalf of the investors, obtained approximately $35 million in mortgage proceeds to purchase the properties from the TJ Group. Ultimately, the scheme collapsed, and the TJ Group did not repurchase the properties or continue making payments to the investors in order to pay their mortgages. The investors were left owning properties with mortgages that exceeded their property’s market value. Newark, New Jersey: Ex-Mayor Convicted of Flipping: As reported earlier, Sharpe James was convicted by a Newark, New Jersey, jury on all corruption charges against him in connection with a scheme that enabled his girlfriend, Tamika Riley, to fraudulently obtain steeply discounted city-owned land and resell it for hundreds of thousands of dollars in profits. Riley was convicted with James on the same five charges: three counts of mail fraud related to the sale of the city lots to Riley, one count of fraud involving a local government receiving federal funds, and one count of conspiracy to defraud the public of James‘ honest services. The prosecution was built around the sale to Riley of municipally-owned properties in Newark, New Jersey. The properties, according to evidence and testimony, were steered to Riley by James, who had a long-running romantic relationship with her. Riley paid only $46,000 for a total of nine properties, and then quickly resold, or “flipped” the properties for more than $600,000. Issues related to the mortgage crisis and melt down of the sub-prime market is all over the media. The FBI has reported that resources are being diverted to handle the up serge of complaints and abuse that seems to arise daily. 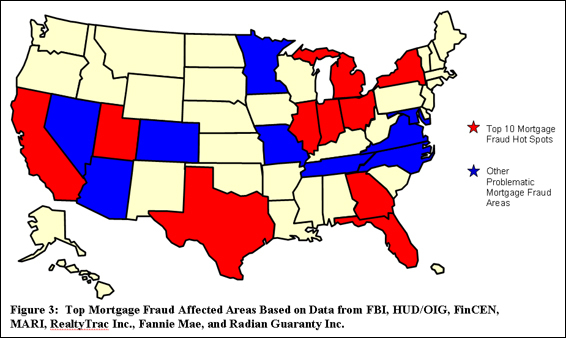 The map below was provided by the FBI to show the dominate areas for mortgage fraud. Every choice has a consequence. As a white collar crime and business ethics speaker, I speak from first hand experience about the truth about consequences. Reality is – no one escapes the consequences of their choices. More and more, I find that my newest presentation is in demand: MORTGAGE FRAUD: Fact from Fiction. Prison is no fun and most of those mentioned above are facing several years plus substantial restitution for mortgage fraud conviction(s). It is true, you reap what you sow and in the environment we formerly came from, it seemed that the cards were stacked in favor of mortgage fraud. IF you feel you’ve been a victim of mortgage fraud – please share your experience so other may benefit. This entry was posted on Sunday, April 27th, 2008 at 7:41 pm and is filed under Business and Personal Ethics, mortgage fraud, prison, white collar crime. You can follow any responses to this entry through the RSS 2.0 feed. You can leave a response, or trackback from your own site. This comment is in reply to the post with Kansas City/Kansas Bonds revoked in Mortgage Fraud Case with Wildor Washington and Victoria Bennett. I unfortunately became a victim of these individuals and there financial schemes. Fortunate enough for me I finally educated myself on what they were doing and not doing and started recording voice transactions. I was able to hand over to the FBI viable information that aided in the revoking of their bonds. This recording occurred after their original arrest and indictment in which I had no knowledge of ever occurring. The unbearable hell that I had undergone the two years before being contacted by the FBI was small compared to the non existent help that I received after the complete knowledge of what these people were doing to myself and the so many other single mothers that became victims. I know of at least 26 other woman that he has put through the same fate. I would love to share my story and empower other people with the knowledge of what can happen in what we assume is to be a very safe transaction when purchasing properties. There is NO safeguard in force for the consumer, no protection against mortgage fraud. There are only safety nets for the mortgage companies and financial institutions. I have had several lawyers assisting me with this case and although there is revocable evidence of fraud I as the buyer is being forced to handle the over $1 million in debt that was incurred during these transactions on property where the appraisal was falsified and the properties are not worth but maybe a quarter of the fraction of debt. The mortgage companies do not care that it was obtained by fraudulent activity and hold the consumer responsible. After all of the devastation that I have incurred I now have to file bankruptcy for these properties and I am being held accountable with a 4 year payment plan in order to pay off some of this debt. As a single mother of four children who can barely make it on a weekly basis, this has been brutal. I truly feel that there needs to be more awareness in what can be faced with such tragedies. I was lied to, manipulated, my identity was stolen. I trusted these people and the laws surrounding the mortgage industry, appraisals and so forth and because of my trust in what was supposed to be a safe guard I am now hanging on a thread to survive. I think about the other 26 woman every day and pray that they have found an easier road to recovery and have found some kind of support that is needed to not only recover financially, but also to recover from the mental trauma and instabilities that has come from such a tremendous downfall on trusting people. I pray that they have not developed a fear of human contact as I had for so long. Update – To poor more salt in the wound I found out today online and not by the FBI agent that so graciously took my information to apprehend Wildor Washington that Washingtons jury selcection is to take place Tomorrow. I cannot believe that I was not informed so I contacted the FBI Agency in KAnsas City and after talking to numerous people I was finaly told of my rights under 18 United States Code section 3771. So I moved along the process to speak with a representative in the Victim Assistance program and she then informs me that I was never listed as a victim. How can that be? After two interviews with an FBI agent, handing them over all my information, crying my eyes eyes, my whole body trembleing with complete trauma and they do not percieve me as a victim. When does the victimizing stop. I feel that I was used and abused by the so called FBI agent and my nightmare is getting even darker. I think it is time to contact a news station. Kerri – what I am getting ready to say you won’t like…so don’t shoot the messenger. The FBI doesn’t care about you as a victim – they care about gaining the evidence needed to WIN the case. They gather data, the US Attorney prosecutes and when they get the win, the criminal is punished. It is personal to you, but not to them. Likely they had evidence the would convict without yours, hence there was no value to listing you as a victim. It isn’t about making you whole – either physically or emotionally – it is about winning with the least amount of effort. I am sorry for your plight and stand ready to listen or provide an opportunity for expression. I wont shoot the messenger. Honestly I understand and my main goal is to see that this person will be punished and will not be able to put anyone else through this again. I am not seeking financial restitution or symphathy. Not that a restitution would not be needed or accepted. I am a fighter and will continue to fight hard to regain my financial responsibilites and provide the means to take care of my children. I am just hurt by the fact that there has not been any kind of assistance provided for what I have been through. No counceling or support group, no legal advice for all of the mortgage companies and creditors threats, no guidence what so ever. I hae been swept under a rug by a so called system that we as Americans believed was our Rights. I printed off rights under 18 United States Code, Section 3771, in which I should have been rightfully given. But seeing as how our very own FBI system fails to register actual victims as victims I do not have these rights. I am thinking that this is how they get away with not following thier very own laws. Money saved is money earned. Stomp on the little people. Thanks for the reply comment. This has been a very long and hard situation with very little support and understanding. I served on the jury for the Ted Murray case and I knew that sentencing was to take place this spring (2009) yet I can’t find any information at all about his (and the other two: L&W) sentencing. Can you help find this information? Thanks for your time. I’d like to see a photo of Karen Lynn Sullivan. Anyone who has been a victim of predatory lending fraud,using strawbuyers to sign fake deeds then passed to Long Beach mortgage,then their continued fraud to deutches chase,et Al contact me. I am victim like you of mortgage scam,strawbuyer strip of equity,and then transfer of fake documents to fraud banks. Let us fight together. Have info,and connections to gov ,and investigations into things that have been burried for years. We can win this. Do not give up to these greedy individuals,who have been taking avantage of innocent individuals a long time. Homeowners,investors, lawyers,ect,even the gov who bailed them out several times and for billions.